In Kaiju Kaos, gigantic and colossal monsters run rampant. Some, like Triunedon – Lord of all Monsters – fall into the “misunderstood” and sometimes heroic category, while the Kaos Monster is an agent of evil, created and used by the Beng-Arii Syndicate to terrorize and plunder. Others, including Gourdzilla and the cosmic entity Cthulhu, are derived from legend and bent on destruction. Kaiju Kaos was created by Bryan K. Borgman (aka Stratos) and released on May 22, 2010. Acheson Creations online store – Acheson manufactures all of our miniatures, figures and terrain. DriveThruCards – Order all of our rule books and stat cards in either PDF or print-on-demand. 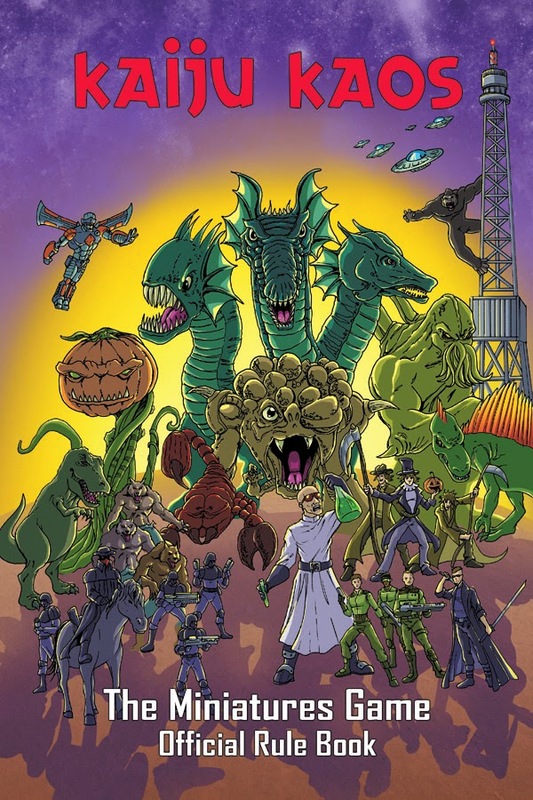 DriveThruFiction – Order official Kaiju Kaos fiction in either PDF or print-on-demand. Storenvy – Our boutique shop of Kaiju Kaos: Smackdown mini figures found only at Storenvy or at shows. WargameVault – Order all of our rule books, game stats, and music.